The Bar Council of India has proposed to amend the Advocates Act 1961, through an internally regulated circular, as reported by Legally India. If implemented, the set of proposals could very well overhaul the regulation of legal profession in the country. The move follows the recent observations made by the Supreme Court of India in Mahipal Singh Rana vs. State of Uttar Pradesh, wherein the Court had noted an urgent need to review the provisions of the Advocates Act dealing with regulatory mechanism for the legal profession. A three Judge Bench comprising Justice Anil R. Dave, Justice Kurian Joseph and Justice Adarsh Kumar Goel had also requested the Law commission and Government of India to take appropriate steps in this regard. 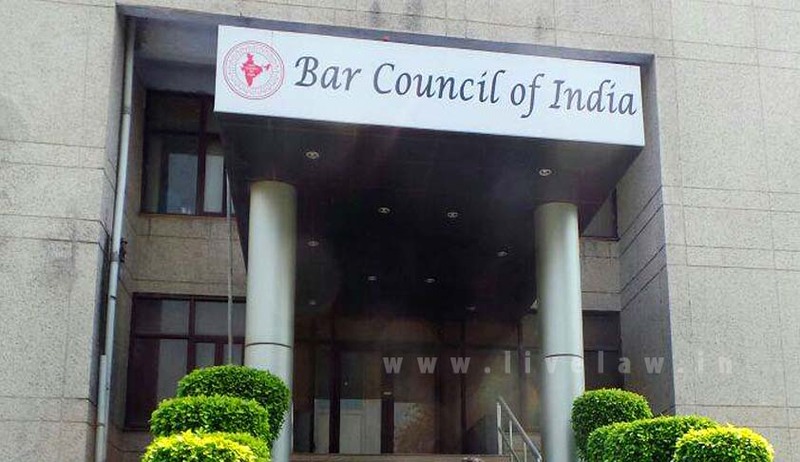 In view of above, LCI had undertaken a study and requested the BCI and all State Bar Councils, Bar Association of the Supreme Court and Advocates on Records Association of Supreme Court, Advocates Associations’ in the High Courts and their respective Benches to send their comments regarding the same. The proposal intends to statutorily provide the BCI with the power to conduct a Common Entrance Test for admission in the institutions imparting Legal Education in the country. In the Counter- Affidavit filed in response to Prof. Shamnad Basheer’s petition for permanent CLAT body, BCI had already offered to conduct the Common Law Entrance Test. Laying special emphasis on its power to regulate legal education in the country as per Advocates Act, 1961, BCI had submitted that the admissions to NLUs are being made on the basis of an admission test conducted by a non-statutory body, even though “a statutory body regulating the legal education in the Country is duly constituted and is capable enough to conduct such admission tests.” In the light of this, the BCI now intends to give a statutory basis to the proposal. You may read the LiveLaw article here. The proposed amendment defines Law Firms to include partnerships, limited liability partnerships (LLPs), private or public limited companies and any other partnerships which are not statutorily registered but are formed, nevertheless, for practicing law. The definition of the term ‘Advocate’ would also be amended to include a law firm and a foreign lawyer registered by the Bar Council of India under the Act. This proposal hence secures law firms and foreign lawyers with the right to practice before Courts and Tribunals in India, unlike the current law which only allows individual Advocates to do so. The BCI would regulate Law firms, individual Advocates and foreign lawyers through rules of professional conduct, as formulated separately for all three categories. Law firms would be enrolled in a roll of law firms which would be separate from the roll of individual advocates. The recognition and registration of foreign lawyers for the purpose of law practice in India would be done on the principle of reciprocity. The proposed amendment empowers the BCI to formulate rules for periodical verification of antecedents, conduct, place of practice of Advocates and to make a data based web-portal of all the advocates. It would further be authorized to make rules for barring non-practicing advocates, and to bar them from voting in the elections to the State Bar Councils and to the Bar Associations. Besides, each State Bar Council and the BCI has been directed to prepare the database of every Advocate, after completion of the verification process, as provided under the Bar Council of India Certificate and Place of Practice (Verification) Rules, 2015. The draft amendments also propose to charge a fee to advocates who wish to get their names transferred from the rolls of one state bar council to that of another. The onus to fix advocates’ enrolment fees has been put on State Bar Councils. 30 per cent of such fee would be deposited with the BCI. The Bar Council of India Certificate and Place of Practice (Verification) Rules, 2015 were notified in January last year. These rules mandate a “Certificate of Practice”, in the absence of which, the Advocate would not be entitled to practice law. You may read the LiveLaw story here. However, the Supreme Court had, in August last year, stayed the proceedings under the Rules, challenges to which are pending before various High Courts. You may read the LiveLaw story here. Under the proposed regime, an Advocate suspended from the rolls would not be re-enrolled if he or she is disqualified due to his or her conviction for an offence of moral turpitude or has been removed in any way from a public office for corruption or for an offence of moral turpitude. Pay a fair and reasonable compensation to the person aggrieved by the misconduct of the Advocate. It further makes provision for imposition of special and exemplary costs on the complainant, in case the complaint is found to be vexatious and frivolous. Such costs may also be imposed on the respondent Advocate, in case he is found to be un-cooperative during the disciplinary proceedings. The disciplinary committee is required to dispose of the complaint within a period of two years from the date of receipt of the complaint or the date of initiation of the proceedings at the instance of the State Bar Council. Failing such disposal, the proceedings would be transferred to the BCI. Complete a three-month training course from a state bar council-affiliated training centre. Pass the All India Bar Examination (AIBE). Practice, for at least two years, before a district or a Sessions Judge and other subordinate courts of original jurisdiction. Practice, for at least three years, before a high court and other appellate forums. The proposal defines Bar Associations to include jurisdiction specific or legal-expertise specific associations, and even associations whose members provide any kind of legal services that are not necessarily linked to court work. If an Association claims to have representatives from more than 75% of the Bar Associations of concerned State, it would get registered with the State Bar Council. Similarly, if any Association or Society has members from at least 20 States of the country, it would be registered with the Bar Council of India. Such registration would require the renewal after every six years. The BCI further grants itself the responsibility of recognizing, registering and regulating bar associations, except for the Supreme Court Bar Association. It hence provides for formation of a Bar Associations Affairs Committee, consisting of seven members, of whom three would be Council members and two members would be either former District Judges or High Court Judges or Advocates enrolled with the State Bar Council for at least 20 years. Lawyers would be permitted to stand for State Bar Council elections if they can prove that they have appeared in a Court, Tribunal or other forum at least 30 times every year for a continuous period of three years preceding the years of elections. The Advocates would have to produce and attach the proof of appearances along with their nomination forms. Besides, the State Bar Councils would be required to have at least 70 per cent of members with 20 years of experience. The original Act prescribes that the Councils should have 50 per cent members who have been on a State Roll for 10 years. The draft rules make provision for reservation of 10 per cent of the elected State Bar Council Seats for female lawyers, provided that they get at least 80% of the votes of whichever male candidate they would displace on the Bar Council. An ‘in-house disciplinary’ mechanism would handle minor disciplinary matters at the local level of the concerned Bar Association. In-house disciplinary matters have been defined to include such acts as would amount to breach of the material terms and conditions subject to which a Bar Association is recognized and registered under the Act, Rules and Bye-laws. Rules in this regard would be formulated by the BCI. The BCI is endowed with the responsibility to constitute one or more disciplinary committees, each of which would consist of three persons, of whom two shall be persons elected from amongst its members. Three quarters of the total number of committees would have one judicial member each. This member would be a former Judge of a High Court in case of the BCI, and a former District Judge in case of a State Bar Council. The Judiciary would make 25 per cent of Bar Council Disciplinary committees, with Bar Council members taking up half of the committee seats, and other advocates enrolled for at least 20 years taking up one quarter of seats. Making provision for controlling and checking the strikes, boycotts or abstentions from Courts by the Advocates, the amendments propose to include a six-year disqualification from contesting elections of any Bar Association or Bar Council. The proposal increases the imprisonment for illegally practising in Courts from the current six months, to five years, and prescribes a fine of Rs. 1 lakh. The Committee would be empowered to hold enquiry into any serious allegation or complaint about corrupt practices or misconduct against any office bearer or member of the Bar Council of India in discharge of his duties as a member of the Council. It would have as Chairman, a former SC Judge or a former Chief Justice of any High Court. It would also comprise of two sitting Judges of different High Courts, one Senior Advocate and one member of the BCI. The report of the Committee would be placed before the General Body meeting of the Council, which may, if it accepts the report, lodge an FIR or refer the matter for initiation of disciplinary proceedings. The proposed amendment endows the BCI with the responsibility to establish a Directorate of Legal Education for continuing legal education for advocates in the country. It further proposes to increase the strength of the Legal Education Committee from 10 to 15 members. Of these, 5 members would continue to be council members, while the others would be chosen from the categories mentioned in the section. These categories are sitting Chief Justices of High Courts, sitting Judges of High Courts, the Chairman of the Law Commission of India, the Attorney General of India, the Solicitor General of India, the Chairman of the University Grants Commission (UGC), the Union Law Secretary, three Vice Chancellors of National Law Universities (NLU), two Vice Chancellors or Deans of Law Institutes other than the NLUs, Senior Advocates of “national repute”, two members of State Bar Councils co-opted by the BCI in such a way that each State Bar Council is given representation by rotation. In addition to these members, the Council is given the liberty to invite any other persons of eminence as a Special Invitee to the Committee. A former Judge of the Supreme Court would be appointed as the Chairman of the Committee. It proposes to establish a Legal Services Committee, which would comprise of five BCI members, and two non-BCI members who are either from the higher Judiciary or are Advocates enrolled with the bar for at least 20 years. The Bar is given a larger role in matters of rendering legal services and in spreading legal literacy, in order to share the burden with the Judiciary. The BCI would be given rule making powers for floating schemes and in making appropriate rules for rendering legal services to the poor and needy and also for spreading legal literacy for which part of the appropriate funds can be made available to it. Read the draft here. Courtesy Legally India.